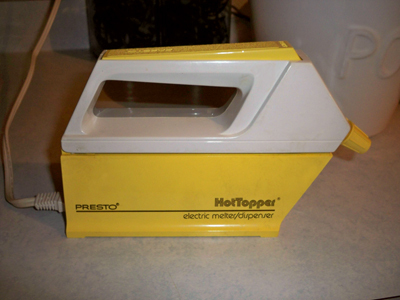 My mom had one of these HotTopper butter melter and dispensers and I just loved it. Well she found one for me. It - is - awesome! You can place a whole stick of butter inside, plug it in, the butter melts and then squirt squirt squirt the butter where you want it. Mmmm. I love butter. OMG, that is a riot! Hmmmm now I wonder too what else you could melt and dispense. tell the truth....did you spray some of the melted butter into your mouth too? Oh my word - I didn't even know these existed before and now I want one really bad! I was just thinking about that the other day. We had one when I was growing up and I was wishing for it the other night. How funny that you just got one. your Mom finds the most awesome things....when I go to tag sales and yard sales all I find is junk! I, like Emily above, want to know if you squirted some in your mouth? I totally would. Oh my gosh, I remember those and the silly jingle too. Like Liz I wondered if it cleans out really well, because otherwise it seems like it would go rancid pretty quickly. But if it doesn't go rancid, it looks fab! 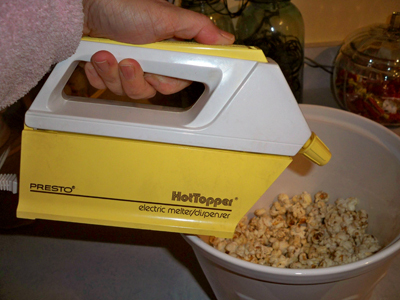 clean up is pretty easy... there is a metal chamber that holds the butter stick... wipe that out and wash with hot soapy water then put it together and squirt hot water out the squirter. If you have leftover butter you could put the bottom in the fridge and save it for next time. The other picture on the box shows it dispensing syrup. So it wouldn't need to be metled BUT you could heat it up and then sqirt it on pancakes! Ok...it was cool before, and now its downright awesome! REDONKULOUS! Lols!! Who knew? It looks right out of the 70s.